The 1967 Chevrolet Camaro with VIN 123377N100001 is significant based on three out of four of the Criteria for Historic Significance. VIN 123377N100001 is the first Camaro built and represents the intense battle of American automakers in the 1960s to build performance inspired, youthful, economical cars known as “pony cars.” This was a significant trend and event in American automotive history. Additionally, the design of the Camaro is effectively represented by this car and is a brand identity and design that continues to this day. 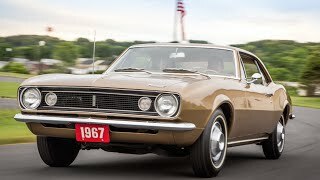 VIN 123377N100001 provides informational value as the first Camaro created by General Motors.